When you need to get around Miami, you should be able to do it in style. Today we take a look at the Honda Accord v the Toyota Camry and grade them in the style department. The right car is a must, especially if you’re used to fighting against rush hour traffic. Getting from point A to point B shouldn’t be a struggle, which is why a lightweight, family-friendly car can make a big difference in your day to day life. The Honda Accord has long been a favorite, preferred over the other cars in its class for its speed, agility, and easy of use. Sleek, sophisticated, and attractive, Miami shoppers can make everyday on the roads a little easier in an incomparable Accord. With room for the whole family and a streamlined appearance that will make you the envy of your friends, the Honda Accord is perfect for every walk of life. Who says you can’t have a great-looking car without spending a fortune? Unlike the Toyota Camry’s boxy frame, the Honda Accord is chic and stylish, boasting clean lines and a streamlined silhouette. With a luxurious interior comfortably built for 5, there’s no better way to travel for Miami Honda shoppers. 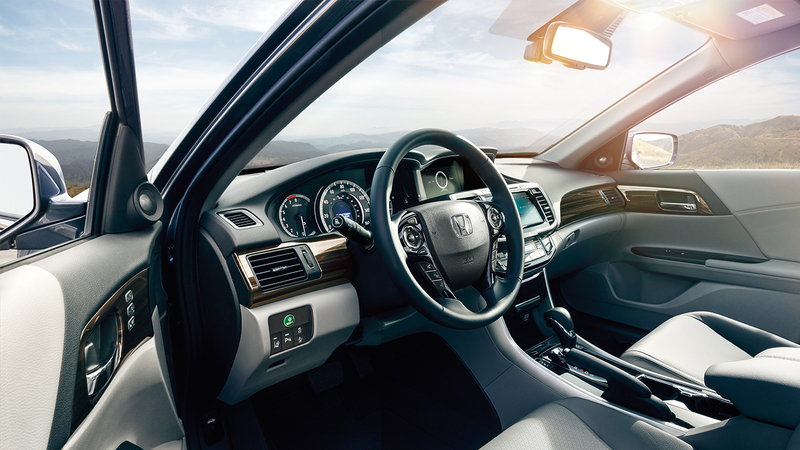 In addition to a stunning exterior, the Honda Accord is a fan favorite on the inside, too. Drivers will always be comfortable with dual-zone automatic climate control, and there’s no getting lost again with GPS capabilities. Accord drivers can even access their favorite Apple iPhone apps on the display screen, providing an interactive experience centered around comfort and convenience. Luxury features are a bonus, but Miami drivers have a need for speed. The Honda Accord has an available 278 HP engine, leaving the Toyota Camry in the dust. With both automatic and manual models available, drivers can choose the model that’s best for them. Miami car shoppers can also benefit from amazing safety features, like a rear-view camera, to make sure every trip is a success. Looking to save money on gas? Of course you are. The Honda Accord boasts better gas mileage than its rival Camry, featuring a whopping 36 miles highway and 27 miles city, creating a clean, safe ride, no matter where you’re going. Battling the Miami roadways may not be easy, but with a Honda Accord, every drive will be a pleasure. Featuring top of the line amenities, fuel economy, and safety features, you’ll never have more fun behind the wheel. Popular Mechanics names Honda Accord ‘Best Sedan of 2016’. The all-new Civic Coupe arrives: stylish, refined, dynamic and connected.